1916 (Dec 22) Changtu to Faku red band cover, then returned to Changtu, f.w. Junk 3c, tied by Changtufu bilingual cds., along with a "return to sender" slip and Changwu cds. On reverse with Tiehling transit and Fakumen arrival. 1918 & 21 two covers with Kirin postmarks, one from Hsiaosuifen to Machiaoho, f.w. Junk 3c, tied by Kirin Hsiaosuifen cds., bearing Machiaoho arrival; the other from Huanghuatientze to Wenshui, f.w. Junk 4c (damaged), tied by Kirin Huanghuatientze cds., bearing Taiyuan transit and Wenshui arrival. Cover stained. F-VF. 1922 & 1925 two covers with Kirin postmarks, both f.w. Junk 3c. One from Huanghuatientze to Wenshui, tied by Kirin Huanghuatientze cds., bearing Wenshui arrival; the other from Shanghowan to Tehhwei, tied by Kirin Shanghowan cds., bearing Tehhwei arrival. Later one with fault. F-VF. 1925 & 1919 two red band covers with Kirin postmarks, one from Shanghowan to Kirin, f.w. Junk 3c, tied by Kirin Shanghowan cds., bearing Tehhwei transit and Kirin arrival; the other from Lalintsang to Shansi Chingyuenhsien, f.w. Junk ovpt. "Limited For Use in Kirin and Heilungkiang" 4c, tied by Kirin Lalintsang cds., bearing Acheng transit and Chingyuenhsien arrival. 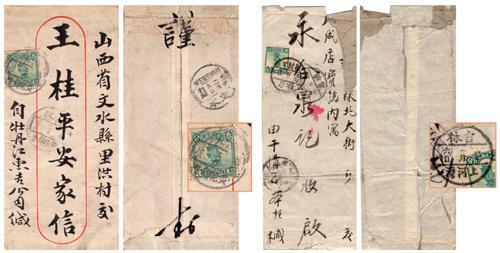 1922 two covers with Kirin postmarks, one from Kirin Tassuchan to Shansi Kiaocheng, f.w. Junk ovpt. "Limited For Use in Kirin and Heilungkiang" 4c, tied by Kirin Tassuchan cds., bearing Kiaocheng arrival; the other from Kirin Liangchuhochen to Shangtung Lungkow, f.w. ovpt. "Limited For Use in Kirin and Heilungkiang" 2c pair, tied by Kirin Liangchuhochen cds., bearing Kirin Yapuli transit and Shangtung Lungkow arrival. 1930 two covers with Kirin postmarks, both f.w. Junk ovpt. "Limited For Use in Kirin and Heilungkiang" 4c, one from Mushihho to Shansi Kiaocheng, tied by Kirin Mushihho cds., bearing Hsiachiutai transit and Shansi Kiaocheng arrival; the other from Kirin Huachuanhsien to Harbin, tied by Kirin Huachuanhsien cds., bearing Harbin arrival. 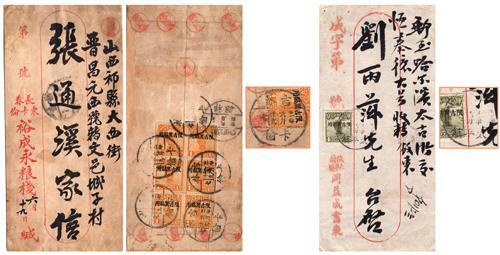 1928 & 1932 two covers with Kirin postmarks, one from Kirin Tungkalun to Shansi Chihsien, f.w. Junk ovpt. "Limited For Use in Kirin and Heilungkiang" 4c, tied by Kirin Tungkalun cds., bearing Shansi Chihsien arrival; the other from Kirin Huachuanhsien to Harbin, f.w. Junk ovpt. "Limited For Use in Kirin and Heilungkiang" 1c × block of 4, tied by Kirin Huachuanhsien cds. 1932 & 1921 two covers with Kirin postmarks, one from Kirin Kalun to Shansi Chihsien, f.w. Junk ovpt. "Limited For Use in Kirin and Heilungkiang" 1c block of 6 (one stamp off), tied by Kirin Kalun cds., bearing Changchun transit and Chihsien arrival; the other from Kirin Taipingchen to Harbin, f.w. Junk ovpt. "Limited For Use in Kirin and Heilungkiang" 4c, tied by Kirin Taipingchen cds., bearing Harbin arrival. 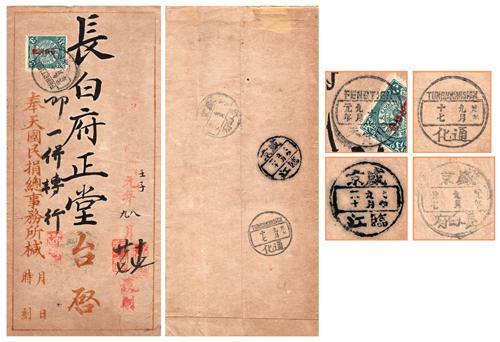 1931 two covers with Kirin postmarks, one from Wencheng to Kirin Kalun, stamp off, bearing a slogan covered the place of stamp off, along with Lirin Kalun arrival; the other from Kirin Tungchingcheng to Harbin, f.w. Junk ovpt. "Limited For Use in Kihei" 4c, tied by Kirin Tungchingcheng cds., bearing Harbin arrival. 1920s two covers with Kirin postmarks, one from Kirin Pankiehhotze to Pinchiang, f.w. Junk ovpt. "Limited For Use in Kirin and Heilungkiang" 1c, tied by Kirin Pankiehhotze cds. ; the other from Kirin Badogou to Germany, via Siberia, f.w. Junk ovpt. "Limited For Use in Kihei" 4c, tied by Kirin Badogou cds. 1912 & 1929 two covers with Kirin postmarks, one from Kirin to Shanghai, f.w. CIP ovpt. ROC 2c, tied by Kirin bilingual cds., bearing Shanghai arrival; the other is a postal letter card 3c from Kirin to Changchun, uprated by Junk ovpt. "Limited For Use in Kihei" 1c, tied by Kirin bilingual cds. Damaged and repaired. 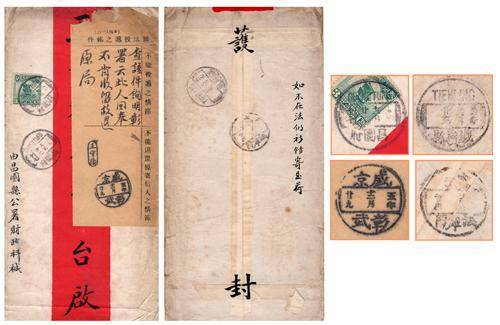 1925 & 1917 two covers with Heilungkiang postmarks, one from Heilungkiang Paochuanchen to Chihli Hanshangfangtze, f.w. Junk 1c × strip of 3, tied by Heilungkiang Paochuanchen cds., bearing Suichung transit and Chihli Hanshangfangtze arrival; the other from Heilungkiang Antachan to Harbin, f.w. Junk 3c, tied by Heilungkiang Antachan cds. Both water stained. F-VF. 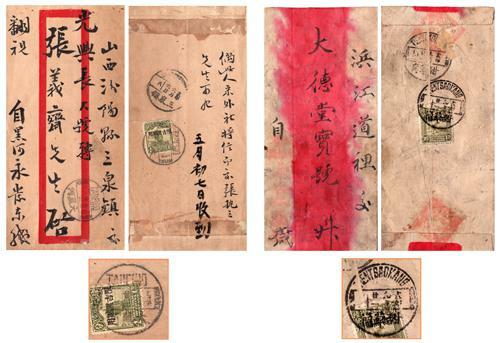 1920 & 1921 two covers with Heilungkiang postmarks, one from Heilungkiang Fenglechen to Shansi Chingyuen, f.w. Junk 3c, tied by Heilungkiang Fenglechen cds., bearing Tientsaokang, Taiyuen transits and Chingyuen arrival, on front showing Taiyuanfu censored marking; the other from Heilungkiang Hailar to Harbin, f.w. Junk 3c, tied by Heilungkiang Hailar cds. 1910s-1920s a group of 3 Manchuria covers, all f.w. Junk 3c, tied by Liaohe, Changtu and Moukden cds. VF-F.
1912 (Sep 10) Fengtien to Shenking Changpaifu cover, f.w. CIP ovpt. ROC 3c, tied by Fengtien bilingual cds., on reverse with Tunghwahsien, Linchiang transits and Shenking Changpaifu arrival. 1923 & 1916 two covers from Szepingkai to Changtu, both f.w. Junk 3c, tied by different types of Szepingkai bilingual cds. 1920s-1930s a group of 3 Manchuria covers, all f.w. Junk issues, tied by Tsingtuitze, Panshan and Tungkangtze bilingual cds. respectively. 1920s-1930s a group of 3 covers with Kirin postmarks, all f.w. Junk issues, tied by Sanchaho, Wukimiho and Hwachwansien bilingual cds. 1920s a group of 3 covers with Kirin postmarks, all f.w. Junk issues, tied by Ninguta, Imienpo and Wulakai bilingual cds. 1920s-1930s a group of 3 Manchuria covers, f.w. SYS State Burial Commemorative and Junk issues, tied by Imienpo, Chuho and Tehhwei bilingual cds. 1930s a group of 3 covers with Kirin postmarks, all f.w. Junk issues, tied by Mishan, Changkiawan and Pankiehhotze bilingual cds. Two covers with faults. F-VF. 1920s-1930s a group of 3 covers with Kirin postmarks, all f.w. Junk issues, tied by Mulinghsien, Yenki and Tamintun bilingual cds. 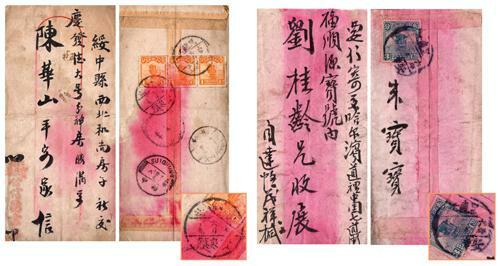 1927 & 1929 two covers with Heilungkiang postmarks, one from Taheiho to Shansi Sanchwanchen, f.w. Junk ovpt. "Limited For Use in Kihei" 4c, tied by Taheiho bilingual cds., bearing Sanchuanchen arrival; the other from Tientsaokang registered to Suichunghisen, f.w. Junk 16c, tied by Tientsaokang bilingual cds. 1920s-1930s a group of 3 Manchuria covers, all f.w. Junk issues, tied by Pamiencheng, Lishu and Heishan bilingual cds. 1920s a group of 3 Manchuria covers, all f.w. Junk 4c, tied by Faku, Tatungkow and Yangtzeshao bilingual cds.